Golden State Warriors superstar Stephen Curry will be venturing into the field of online education and serving as an instructor. The two-time MVP is partnering with MasterClass to embark on his first online courses in which he'll teach, in a video component, the fundamentals of what makes him one of the most skilled, creative players in the NBA. Steph Curry is launching a series of online courses for MasterClass.com. He'll teach basketball fundamentals and philosophies of the game, joining Serena Williams, among others, to teach on the platform. In an exclusive interview with ESPN, Curry explained his passion for sharing his knowledge of the game. "If I think about where I was when I was 13, if I had access to this type of curriculum, I would have been a much better player faster," he said. "It took me a while to learn how to practice and do the drills the right way. I want people to see how I invest in my game, how I train, what I do in my workouts and what's my mental approach. So when the opportunity with MasterClass came about to put a class together where I can show people my unique way of playing this game, it was [a] natural fit. The goal is for everybody to get better and enjoy basketball more. I want them to push and challenge themselves, and hopefully they see the game differently." MasterClass, an online educational platform that offers classes by experts in their respective fields, has instructors on staff ranging from Serena Williams and Samuel L. Jackson to Christina Aguilera. Curry is the company's first basketball player. His class is now open for pre-enrollment at www.MasterClass.com/SC and will go live in early 2018. He will also occasionally pop in for Q&A sessions. He said he's going to benefit from the courses, as well. "I get to assess my own game and see what I could have done better, like when I get into a pick-and-roll situation, or a situation where I have to make quick decisions, you can freeze at that moment and explain everything that can possibly happen with all the different outcomes and why I chose to do what I did, versus what I could have done better," Curry said. "I think hearing that from my perspective should be pretty interesting to people who either watch our games or just play basketball themselves." The enrollment fee is $90 for an individual class and $180 for a year of unlimited access to all classes taught by their professionals. The access can also be purchased as a gift for others. "Stephen is a lifelong student of the game of basketball," said David Rogier, CEO and co-founder of MasterClass. "After barely being recruited by college coaches, he dedicated himself to the game and became the best shooter in NBA history. The way he studies other players, deconstructs his own game and constantly innovates makes him an amazing teacher. He inspires all of us that if you focus and work hard, you can become the best at whatever you do. He's simply world-class." As part of his curriculum, he'll provide step-by-step tutelage on ballhandling, shooting techniques, the creation of offense, playing ball screens, proper balancing and finishing on either side of the rim, to name of few. He said he stresses proper mechanics and reveals the details of his workout regimen used during the season and offseason. 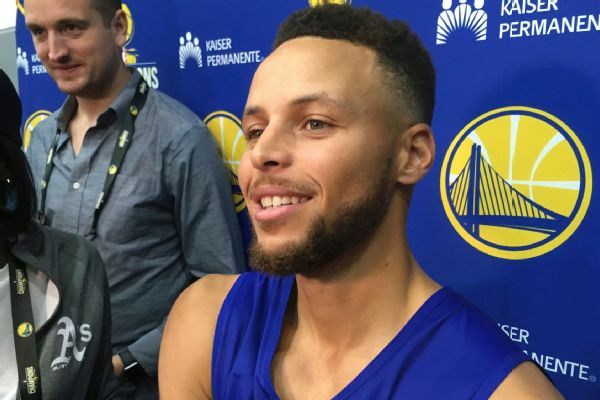 "For me, it's a cool learning process because I actually get to articulate a lot of the things that are pretty natural to me, but it might not be natural to others," Curry said. "It came together really nicely. The visuals and the production are unbelievable. It allows me to explain all the things that I do to get better." At 6-foot-3, Curry isn't the tallest, fastest or the most athletic, making the way he dominates the game so relatable to the common individual. "There is no dunking chapter," he said laughing. "So, if you're looking for that, then this is the wrong place to go." Curry said his class is for beginners and intermediates who seek to advance the acceleration of their games. With the way the game has changed toward shooting more 3s, even in transition, Curry said he wants people, especially kids, to understand that there is a maturation process that must go into effect before being given the green light to pull those long-range shots frequently. "We talked about that in the class a little bit," he said. "There's a progression to everything that I do. So, if you watch our games and you see the way that I play and you don't know what goes into the work behind it, then you might obviously have that opinion that if you want to play like Steph, you just show up to the court, shoot 40-footers or shoot off of one foot, try all these crazy dribble moves, and that's how you play. But there is an education about just how much time I put into what I do. "Some of the stuff you see after practice, the drill work and the repetitions and the mindset, it starts with fundamentals, it starts with foot work, it starts with balance, it starts with coordination. That builds your confidence up, and then you can start to try a little bit more crazier things on the court. So, I hope through this MasterClass people see the way that I play and hopefully understand how I got there. It's a lot of time that I put into it, and it's not like I just woke up one day and was like, 'You know what, I just want to start shooting and doing all these crazy things on the floor.' If kids work on it, or if they put the time in like I did, they can do that, too." When asked why he's starting this program now, he responded that it's the "right time and the right partner." He encourages fans of basketball to give his course a try. "I feel like I have a lot to offer when it comes to what I've learned from the game and what I've learned from myself and how the game has evolved," he said. "I feel like people can learn from me and can be impacted by how I approach the game, and this is another way for that to spread to the next generation of basketball players. Everybody says 'Like Mike,' but you have to be able to see what that means."